Though the days are officially getting longer again, it is still important to plan for safe running when it’s dark. Ken Friesen from Stride Ahead Sports shows some products that protect you in the dark. All it took were a few hours with Ron Burgundy to get a mega crowd of nearly 11,000 to come out and watch the Canadian curling Olympic trials yesterday. Sure, some were curling fans, but being the nosy, celebrity-obsessed creatures that we are, many just went to the MTS Centre to see Will Ferrell’s buffoonery as a guest host. If Ron Burgundy can produce curling fans that easily, I don’t see why this list of celebrities who run marathons can’t get a few folks on the running wagon. And you’ll never guess who’s number one on the list. 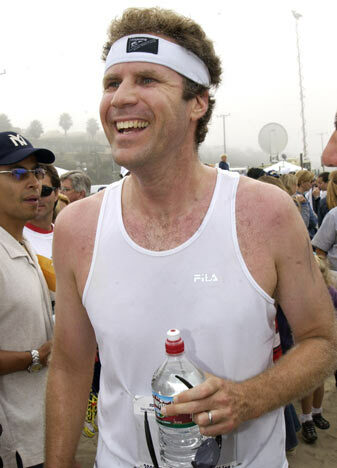 Will Ferrell (for real!) – 3:56:12 at the 2003 Boston Marathon. Katie Holmes – 5:29:58 at the New York City Marathon. P. Diddy – 4:14:54 at the 2003 New York City Marathon. Al Gore – 4:58:25 at the Marine Corps Marathon in 1997…while he was still Vice President! Shia LaBeouf – 4:35:31 at the 2010 Los Angeles Marathon. Ryan Reynolds – 3:50:22 at the 2008 New York City Marathon. Drew Carey – 4:41:39 at the 2011 Marine Corps Marathon. Pamela Anderson – 5:41:03 at the 2013 New York City Marathon. 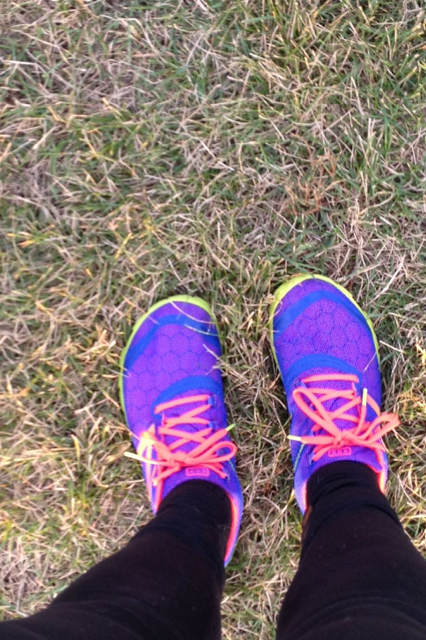 A few weeks ago, I went to a cool little running clinic at Stride Ahead Sports run by New Balance. Under the instruction of a fellow named Ryan Russell, myself and about twenty others learned about transitioning into minimalist running with shoes to try out and a workshop outside. I didn’t quite know what I was getting into when I went—I’m not actually planning to switch to minimalist just yet and I showed up straight from school wearing riding boots. However, it was a great experience, I got some pointers on how to fix my form, and thankfully we were able to test out the shoes outside. We weren’t pressured to buy, we were just encouraged to learn. I appreciated that. Anyhow, the group went outside and did some exercises. I thought it was interesting that while many of us were told to work on different things like hips, arms, and posture, one thing mostly everyone needed to improve was cadence.Up until now, cadence was never something I really considered. Basically, the slower the cadence, the longer you are in the air and the harder you land. I can see why it’s important for minimalist running, you don’t have much of a crutch when you land and it is important to protect your joints. But if, like me, you are still jogging in cushioned runners, it is still good practice to at least be aware of your cadence. One way to do that is with an app. We used this at the clinic. Ryan had us run to the tempo of a mildly irritating beep on his iPhone. It was easy to get used to, but I can’t picture going for a long run with that thing ticking in my ear. We were told a good cadence is 90 steps per minute, or 180 if you count both feet. Many advanced runners I’ve talked to prefer to run without music to keep better in touch with their bodies. Personally, I feel a lot more energized and “pumped up” so to speak with a good playlist. Plus, every time I update my playlist I really look forward to my next run. Check out the links below of some sites that have compiled playlists for you of songs with approximately a 90 beat per minute cadence. If you have rhythm, trying some out can be a fun experiment. Some are even available on their respective apps. Good luck! Running is the last thing on my list of things to do today. For me, today is about family and good food and drinks. In fact, I am cooking my first ever turkey today a la Gordon Ramsay, and I am excited to see how it turns out. It’s wrapped in bacon, so I can’t see how it could go wrong. Enjoy your Thanksgiving meals, and your delicious turkey leftovers. Running resumes tomorrow. Last year I tried outdoor winter running for the first time. Despite doing a Google search of how I should dress, I still wound up coming home from my first run with a totally chapped face and frozen legs. But more importantly, I loved it. I’ve been running on and off for years. My love for running started when I was about eight years old when I began doing the Super Run at the Manitoba Marathon. I slowly worked my way up to a few 10ks, and eventually two half marathons. My first half marathon was probably one of the hardest things I have ever experienced, ever. I was running in shoes from Zellers that I thought were just fine and developed ITBS in my knee as a result. Even on the last mile—Irv’s mile—I was ready to quit (I still swear it’s twice as long as they say.) Thankfully, my dad, who also runs, motivated me to push to the finish. He even let me beat him despite my holding him back the entire way. The sense of accomplishment I felt that day is why I still run. I have always been a seasonal runner. I enjoy the cool breeze that accompanies spring and fall jogs. Summer for me is just too hot, and winter is too cold. Until now. Everyone’s got a list. On my list is to one day run a full marathon. The thought of doing that at this very moment is terrifying because I’m hardly in my best shape. I have developed a pattern over the years. Every spring when the last snowflake melts, I hit the pavement and whip myself into shape for the summer. Given the lifespan of a Winnipeg winter, that usually gives me a starting point of about April. Come June, I decide whether or not I’m up for a race. I love the Manitoba marathon because I grew up with it. My mother says she can’t remember a Father’s Day she wasn’t at the U of M at 7:00am cheering somebody on. But there is absolutely no way I will ever work my way up to a full marathon with 20 minute treadmill workouts and hiding inside until April. I have incorporated this mission of mine into an Independent Professional Project at my school – Red River College. With support from my instructors, I am learning my way through winter running, blogging about it, and video logging what I learn with friends I meet along the way. Keep an eye out for weekly videos from people who know more about this than me. I am excited to take on my current challenge of running the Hypothermic Half Marathon this February. I look forward to hearing about your journeys too, and I welcome any and all the tips you have on running in Winterpeg.